The latest in a series of digital site sensitive works by these four Chicago based artists, "The Mooring" creates haunting visual/textual memorials to disappearing working class iconographies, particularly those that place the masculine figure in relation to domestic and vehicular spaces. 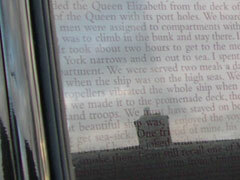 From the living room windowsill of 38 Stanesfield Road, carefully constructed acts (both written and performed) of labour and mourning are projected each evening onto the side windows of the taxi cab. A silent figure builds, with model farmhouse, tools, tractors, lorries, and die-cut men, a series of near-still portraits that are interrupted by the attempts of a software program to represent task-based labor through graphical and textual routines. The scenes give homage to the passing of a day that is haunted by the absence of men who, through death or infirmity, have left their labours behind - whose vehicles will not run anymore because the worker has stopped working. The daylight state of the piece reveals a further narrative fabric around the taxi of images and texts partly drawn from journal entries made by Thomas J. Morissey Sr., a World War II veteran, who died in 2004. 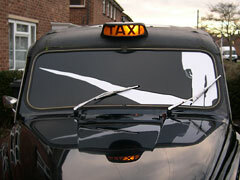 Front and Rear Windscreen designs by Sidera Origer. Thanks to Roger Brown/George Veronda Residency Programme of The School of the Art Institute of Chicago. 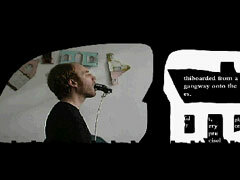 Mark’s work incorporates performance, installation, object, and video. The work is often site sensitive in its nature, reflecting a response to the context of space, time and its relationship to the body and the memory it evokes. Mark is interested in the occupation of labour, its task with hand and body, presence and the commitment to the act. In each of the works there is always an attempt to a heightened awareness of materiality (and its subsequent relationships to each other and the figure). Mark Jeffery is currently an adjunct assistant professor at The School of the Art Institute of Chicago where he teaches in the performance department and First Year Programme. He is also member of Goat Island, a collaborative International Performance group based in Chicago. He has shown his solo work in numerous spaces and contexts including National Review of Live Art Glasgow 2004, 1996, 1994, ICA London, Arnolfini Bristol, Firstsite Colchester, Green Room Manchester, Chapter Cardiff. Judd Morrissey is a writer and programmer whose work in electronic literature has been widely and internationally received and exhibited. With his hypertext, The Jew's Daughter, he introduced his unique form of digital narrative, an unstable, self-evolving, virtual page that continuously re-writes itself in response to the reader. My Name is Captain, Captain., a digital 'night-flight' poem created in collaboration with Lori Talley, was published by Eastgate Systems in 2002. Judd is now concentrating on a new work in progress, The Error Engine, an experiment in writing and artificial intelligence that reflects his ongoing concerns with the relationship of literature and accident and the nature and future of the book. He teaches in the Art and Technology Studies department at the School of the Art Institute of Chicago. Judd received his MFA from Brown University. His work has been included in symposiums and exhibitions such as from The Error Engine (Chicago and Providence), Cerisy 2004 (Normandy, France), Computers and Writing 2004 (Honolulu, Hawai'i), The Book Reconsidered (Boston), E-poetry 2003 (University of West Virginia), Language and Encoding (University of Buffalo), ELO State of the Arts Symposium (Los Angeles), WebRacket at the DeCordova Museum (Lincoln, Ma), DAC2001 (Providence), p0es1s: International Exhibition of Digital Poetry (Germany), File2001 (Brazil), and Digital2000 (NYC, Philadelphia). His pieces have been reviewed by The New York Times, The New Republic, RAINTAXI, The Iowa Review, and TENbyTEN magazine. Lori Talley holds a BA in Music Program Zero from Bard College, where she worked with composer and theorist Benjamin Boretz. She earned her MFA at the School of the Art Institute of Chicago. Talley's work in electronic literature and composition is widely recognized and has been included in several international exhibitions including: The Overgaden Sound Art Festival 2004, Rethinking Time and Space across Literature and the Arts, Boston Cyberarts 2003 & 2001, P0es1s: International Exhibition of Digital Poetry, DAC2001 and ISEA97. Recent publications include My Name is Captain, Captain (Eastgate Systems 2002), Now Culture.com: NC1 Magazine, A Call for Silence, Song Bird: Sonic Arts Network. Interview published in the April 2003 online issue of the Iowa Review. Talley is the Director of Digital Production at Cramer-Krasselt Chicago and continues to teach in the evenings in the Sound Department at The School of the Art Institute of Chicago. Nathan Butler is a sound artist and painter currently pursuing his Master's Degree in Sound at The School of the Art Institute of Chicago. His work ranges from studio pieces created from field recordings to multi-channel audio documents of activities in acoustically particular spaces.